SIGVARIS Sheer Fashion is designed in a variety of fashionable colors with a sheer toe and heel area. The stylish sheer collection helps promote leg health, provides relief from a range of symptoms, and is perfect for travel, work, or every day wear. 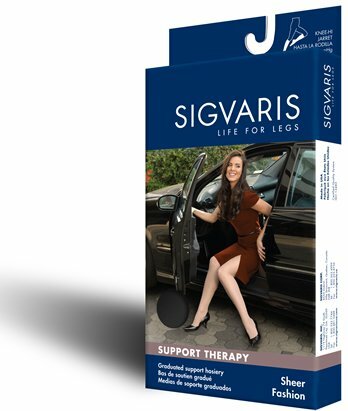 For prevention and mild to moderate symptoms: The fashionable SIGVARIS WELL BEING collection helps promote leg health and provides relief from a range of common symptoms including tired, aching legs and swollen feet and ankles. About SIGVARIS: The Swiss company SIGVARIS, 100% family-owned since it was founded, is the global market leader in the manufacture of medical compression garments for over 150 years. SIGVARIS Sheer Fashion is designed in a variety of colors with comfortable stretch and pantyhose fit. The stylish sheer collection helps promote leg health, provides relief from a range of symptoms, and is perfect for travel, work, or every day wear. BEST FOR: For prevention and mild to moderate symptoms such as tired, heavy, restless, aching legs; travelers; occupational leg health risks; expecting mothers; swollen feet and ankles; family history of chronic vein disease. FRIENDLY TO YOUR SKIN: Comfortable stretch allows for ease in putting on and taking off while preventing perspiration and heat build-up. Sheer Fashion stockings improve circulation, increase energy and aid in keeping legs healthy. DURABLE: Double-covered spandex yarns for optimum comfort and durability with an improved design for a soft feel against the skin. CARE: Hand washing is recommended, but you may machine wash on the gentle cycle with garment turned inside out.